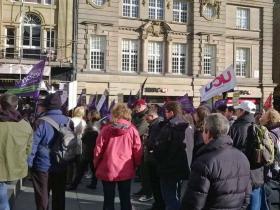 The recent wave of pension strikes at UK universities was the biggest action the sector has ever seen. The unwavering commitment of staff over the fourteen strike days – along with the overwhelming support from students – was instrumental in wresting a much-improved offer from the university employers. The strikes’ success depended on the backing of thousands of international staff who play a vital role in our increasingly global higher education sector. Yet for those on Tier 2 “skilled worker” visas, taking part meant more than simply giving up pay or braving freezing temperatures on picket lines – it meant risking their immigration status. That’s because staff on those visas are subject to strict limits on unpaid leave. If a migrant worker exceeds 20 days’ unpaid absence in a calendar year, their employer is obliged to report them to the Home Office and withdraw visa sponsorship. The Home Office Immigration Rules also say that exceeding this limit could be grounds for revoking a migrant’s leave to remain in the UK. There are some exceptions for those on parental leave or long-term sick leave – but industrial action isn’t covered in the list of exemptions. The government has so far failed to provide clarity on the issue. When asked if strike absences would count towards the limit, the immigration minister simply said that decisions about whether to revoke a migrant’s leave would be made with “full regard to the circumstances”. This ambiguous position is problematic on a number of levels. First, because being able to strike is a fundamental right. It’s enshrined in article 28 of the Charter of Fundamental Rights of the European Union. It shouldn’t be left to the discretion of Home Office officials whether engaging in strikes will lead to deportation. Second, at a time of daily headlines about the government’s abysmal treatment of Windrush migrants and the impact of the Tories’ toxic hostile environment immigration policy, the minister’s vague response is hardly reassuring. The stories of those failed by the immigration system only reinforce the need for absolute clarity on migrant rights. Third, the issue may also be about to get much bigger. Brexit is looming and the 2.4 million EU citizens who work in the UK could shortly become subject to the UK’s visa system. If the immigration rules are allowed to restrict their engagement in lawful strike action, our industrial relations will suffer as a result. All staff should be able to play a full part in legitimate strike action without fear of reprisal, regardless of where they are from. Migrant workers contribute to our economy and should be able to join their colleagues in defending their employment rights. Strike action is never taken lightly. But this restrictive rule means that migrants who need to take unpaid leave for other reasons – perhaps to look after a sick relative – find themselves unable to participate for fear of breaching the limit. International staff need an unequivocal, written guarantee from the government that days spent taking legitimate strike action will not put their immigration status at risk. A small clarification from government would make a big difference to the lives of those affected.